Molly XLIII's Story . . .
Update 04/18/2013: "Cultures were taken which indicated that the poor girl has two types of ear infections." Molly’s tummy issues have been evaluated by her vet, who found no conclusive reason for her occasional vomiting. During the appointment, however, it was discovered that Molly had a very bad ear infection. Cultures were taken which indicated that the poor girl has two types of ear infections. Final lab work is pending to determine which medications will be appropriate for treatment. As her family continues to help Molly while she works through her health issues, she remains the sweet, loving girl they know her to be. Keep posted for more news on Molly. When she becomes “available,” you won’t want to miss the opportunity to add this beautiful girl to your family. Update 03/06/2013: "One of Molly's favorite activities is lying on her human's lap and drifting off to sleep." Molly has adapted very well to her foster home. Due to her blindness, she is a calm girl and not as actively playful as many Springers. When walking outside, Molly takes it slowly and carefully. Smart girl! One of Molly's favorite activities is lying on her human's lap and drifting off to sleep. She also is a big fan of food and enjoys walking around the kitchen if she thinks food prep might be happening. For this reason, it would be best if Molly's forever family members are quick on their feet. She might inadvertently become a tripping hazard for an older person. Recently Molly has had a little bout of vomiting. Her foster mom is working on discovering the cause of this and hopes to have her tummy settled soon. You won't find a dog more loving and sweet than Molly. On a chilly night, she'll keep your lap toasty and your heart warm! Original: "Although Molly is in good health now, she had a stroke two years ago which left her almost totally blind." Sometimes the arrival of a second baby can be overwhelming for parents and they find that extra time is a scare commodity. Four-footed family members especially can take the brunt of this change. This was Molly's case when her North Carolina family's second child was born in January. 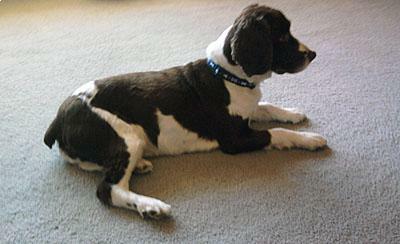 Molly's parents no longer had the time to care for their Springer girl like they did before. Wanting her to have a wonderful new home that could provide her with the love and attention she deserved, they relinquished Molly to MAESSR. Just as Molly enjoyed belly rubs from the four year-old in her original house, so she has enjoyed the attention of the grandchildren in her foster home who are from three to ten in age. She is a very gentle little lap dog with them and with the adults she has met. Currently, there are no other dogs or any cats in her foster home, but reportedly she was good with a relative's cat in her previous home. When Molly was taken on an adventure to a local pet store, she was a little nervous with other dogs she met there because she could not see them approaching her. Before she became blind, Molly had enjoyed going to the dog park where she was good with the other dogs. Although Molly is in good health now, she had a stroke two years ago which left her almost totally blind. Despite some bumping into walls and furniture, she is learning to navigate around her foster home without too much trouble. Molly is housetrained and will scratch at the door when she wants to go outside. Her people must be attentive to this signal, because she will eliminate inside if no one comes to let her out. She had never been crated and when her foster mom tried it once, Molly barked and was very upset. Now when her foster parents are not at home, Molly has free run of the house; she usually just gets up on the couch and sleeps without damaging anything. Good girl! Molly is quite content to be a lap dog getting belly rubs or just snoozing on the couch; however, there is a playful side to her too. She sometimes plays with her toys with the assistance of her humans who give them back to her when she drops them. Generally, Molly's house manners are good, but she does try to counter-surf. As she is very food-oriented, she goes into search mode to sniff out where this good smell is coming from. She is fed in the kitchen and does not have food aggression. Quite willing to be a companion on car rides, Molly is a good passenger. She greets people nicely, too, and she is good on leash walks without pulling. Due to her blindness, her foster parents clap hands and call her name to have her come to them. Since she gets very nervous when going to the groomer or to the vet, Molly's her previous owners would sedate her a little before making those visits. Don't let Molly's blindness stop you from considering her as your next family member. Once she learns the layout of your home, she'll be fine!